The ear has three main parts or sections - the outer ear, middle ear and inner ear. Each section has a specific function that allows sound waves that enter the ear to be transformed into electrical impulses that the brain can understand. The outer ear collects sound waves and directs them to the middle ear. The middle ear then amplifies the sound and transmits it to the inner ear. The inner ear converts the sound vibrations into electrical impulses that travel along the auditory nerve to the brain. Conductive hearing loss is caused by damage to the outer or middle ear. With a conductive loss, sound waves are blocked as they move through the outer or middle ear. Since the sound cannot be conducted efficiently, the sound energy that reaches the inner ear is weaker or softer. A conductive loss can result from infection, excessive earwax buildup, fluid in the middle ear, damage to the middle ear bones, a perforation of the eardrum or a foreign body in the ear canal. Sensorineural hearing loss is caused by damage to the inner ear. Sound waves travel normally through the outer and middle ear, however, the inner ear is unable to pick up the vibrations or is unable to send the vibrations to the brain. Also called "nerve deafness", it usually occurs in both ears. A sensorineural loss can result from infection, disease, certain drugs, excessive noise, birth defects and aging. Mixed hearing loss is caused by damage to the outer/middle ear and the inner ear. Typically, sound waves are not conducted efficiently to the inner ear, and once they reach the inner ear the vibrations cannot be picked up or sent to the brain. Therefore, a mixed hearing loss is the combination of a conductive and sensorineural hearing loss. See "Signs/Symptoms" under Conductive hearing loss & Sensorineural hearing loss. 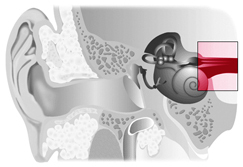 Central hearing loss is caused by damage to the auditory nerve or hearing centers. Sound waves are transmitted normally through all three parts of the ear, however, the auditory nerve may not be able to send the electrical impulses to the brain or the hearing centers of the brain may not receive the signals correctly. A Central loss can result from head injuries, disease or tumors. Detecting sound but not being able to understand or process it. The inability to hear speech and other sounds can occur in any individual, regardless of race, gender or age. In the United States alone, an estimated 28 million people have some form of hearing impairment, and more than a million school-aged children have a hearing loss that can significantly impact speech/language development and education. Hearing loss can be temporary or permanent, mild or profound. Fortunately, in most cases, something can be done to improve the hearing impaired person's ability to communicate. For many, the purchase of a hearing aid is the first step in rehabilitating their hearing and reconnecting with the world around them. Early detection and treatment of hearing loss is crucial. See a hearing care professional immediately for a complete hearing evaluation if you suspect any type of hearing loss. The following tests are typically part of the hearing evaluation. A special machine (audiometer) is used to measure the softest tones you can hear. You will hear various tones/pitches, from low to high, at various levels. The range of pitches tested encompasses those found in everyday speech. You will be asked to raise your hand or press a button when you hear the tones. The hearing care professional will determine, based on your responses, the softest tones you can hear at each pitch and record them on a graph called an audiogram. The audiogram helps identify the type and degree of hearing loss you may have. These tests measure the middle ear's ability to conduct sound. They may detect fluid buildup in the middle ear space, a perforation of the ear drum or other problems in the middle ear. During your evaluation, you will not only be asked to respond to various tones but to listen to and respond to speech, either in the form of words or sentences. This provides the hearing care professional with information regarding your ability to detect and discriminate speech. If your hearing care professional determines that your hearing impairment does not originate from a medical problem, which can be treated with medicine or surgery, a hearing aid evaluation can be performed to determine if you are a good candidate to use hearing aids. Although hearing aids do not provide normal hearing to the user, they can help improve a hearing impaired person's ability to communicate effectively.